Storing, managing, sharing, curating and especially analyzing huge amounts of data face an immense visibility and importance in industry and economy as well as in science and research. Industry and economy exploit ’Big Data’ for predictive analysis, to increase the efficiency of infrastructures, customer segmentation, and tailored services. In science, Big Data allows for addressing problems with complexities that were impossible to deal with so far. The amounts of data are growing exponentially in many areas and are becoming a drastical challenge for infrastructures, software systems, analysis methods, and support structures, as well as for funding agencies and legislation. 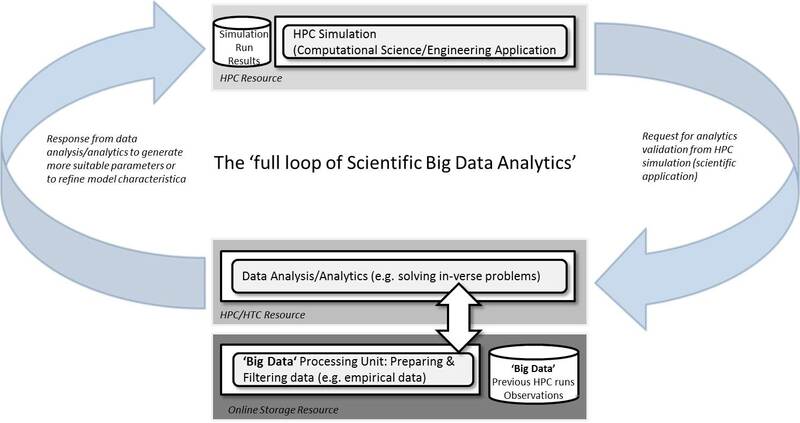 In this contribution, we argue that the Helmholtz Association, with its objective to build and operate large-scale experiments, facilities, and research infrastructures, has a key role in Tackling the pressing Scientific Big Data Analytics challenge. DataLabs and SimLabs, sustained on a long-term basis in Helmholtz, can bring research groups together on a synergistic level and can transcend the boundaries between different communities. This allows to translate methods and tools between different domains as well as from fundamental research to applications and industry. We present an SBDA framework concept touching its infrastructure building blocks, the targeted user groups and expected benefits, also concerning industry aspects. Finally, we give a preliminary account on the call for “Expressions of Interest” by the John von Neumann-Institute for Computing concerning Scientific Big Data Analytics by HPC.